The Golden Weeping Willow tree (Salix x sepulcratis var. chrysocoma / Alba Tristis) is a tree found alongside rivers and lakes and wetland areas. A fast-growing, rambling, weeping tree, making at least 1m (1ft 4in) of new growth per year. Reaching a final height of 20m (66ft 8in), if left untrimmed, this tree is distinguished by its attractive new growth in spring, which is a warm golden colour. 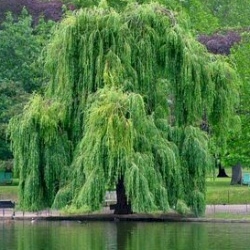 Like all willows, this tree is best planted well away from buildings as its root system can interfere with foundations. Our Golden Weeping willow trees are supplied at a height of between 1.5 and 2.60 metres in a 7-15L container for year round planting and better results than from bare-root or rootballed stock. Depending on supplier and several other variables, they are most likely to be a Half Standard which means they will have been pruned to ensure there is a section of trunk clear of branches. This gives it more of a tree shape rather than a bush. If this is absolutely important to you, please contact us before purchase to ensure we have the right shape in stock. The size range is so broad because they are vigorous trees and depending when in the year you buy them will determine which end of the scale you are buying at. We usually have several size options to choose from and these are shown above. As with most weeping trees, you can determine final height by allowing the tree to grow to the height you require and then cut the main trunk/stem. If you are going to restrict growth by keeping it in the pot (not advisable), you need to remember to feed every year and to water regularly depending on the pot size. The smaller the pot, the sooner it will dry out and kill the tree. Willow are very thirsty trees and can be put under stress by inadequate watering leading to issues such as black spots on the leaves. This is not a permanent problem and the tree can recover as soon as adequate water is provided. During the Summer, the tree may need watering every other day for the first season or two until it gets well established. Feeding the tree will also help the tree maintain good health. August 2016: Hello Alan, I just received my beautiful Weeping Willow today - she is very lovely! Thank you so much for such a fab service. Once we have created the big pond, and she is next to it, I will send you a photo. Kind regards, Marjory. Hi Alan, Delivery was fine. Golden Weeping Willow Tree arrived well packaged. Planted it as per the instructions, drove the stake in and tied it. Added a second stake as tree is quite tall and put on a rabbit protector as we've had a few visitors from the common this year. Covered earth with wood chippings and then placed some pieces of decking on top to discourage any cats from digging in it. It seems to have caught really well. I did get a few yellow leaves from over watering but that seems to have cleared up now. Very please with it, thank you very much. Picture attached although the model doesn't want to be named for legal reasons. Best wishes P. Editors Note (If there is a picture of a "mature lady" in the pictures, this is her! May 2014: Hi Alan my lovely willow has arrived thank you. Aisha Ahmed. Dear Alan,My beautiful weeping willow has arrived and has been safely planted overlooking my duck pond. Many thanks for your excellent customer service and for the quality of the tree. September 2012: Hi Alan, Thank you very much for the delivery, please don't worry, both trees arrived in good time and in good condition via our usual friendly and careful couriers. This is my second order from Trees-Online and previous trees bought are thriving. In the process of planning next purchase. Sandie Jones. 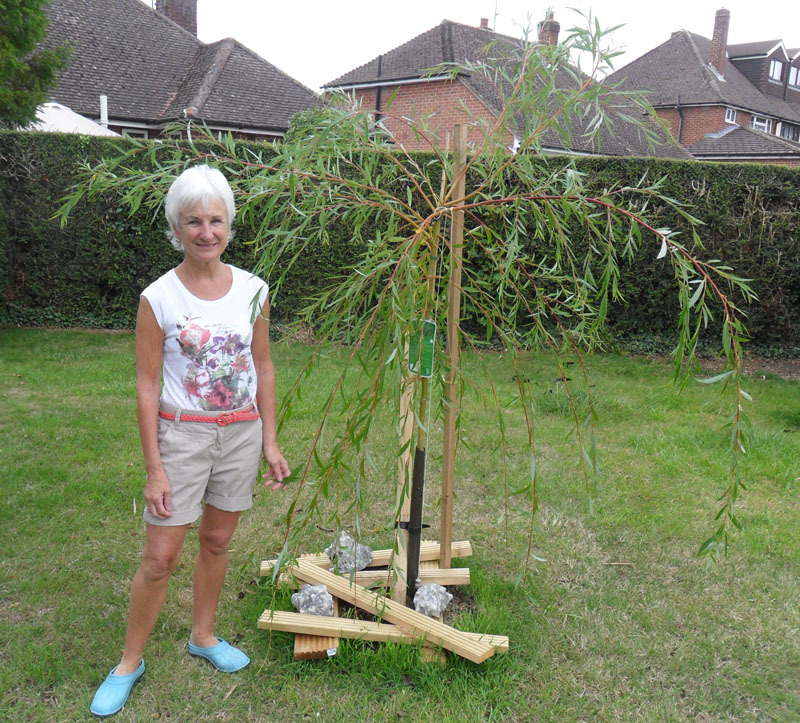 August 2012: ‘I ordered a Golden Weeping Willow from Trees Online and am delighted with the product. It arrived in a large and sturdy cardboard box in perfect condition and is now planted and looking great. Many thanks for a smooth online purchase. I will definitely order more from you and recommend your website to my friends.’ L. Wade.